Avex DVD to PSP Video Suite is an All-in-One & One-Click solution to create PSP movies. It converts DVDs, TV shows and home videos directly to PSP. The software combines DVD to PSP Converter and PSP Video Converter in one package at great discount. The software features superb video/audio quality, the fastest conversion speed (Up to 3x faster). And it's easy to use! A great software for PSP fans. ...... A great software for PSP fans. (2) Built-in X!-Speed? transcode technology. Up to 3x faster than conventional converter. (5) Adjustable video size: 320x240, 368x208 and even undocumented 400x192 (extra-widescreen secrete resolution). (6) Optimized settings for superb video playback on PSP devices. 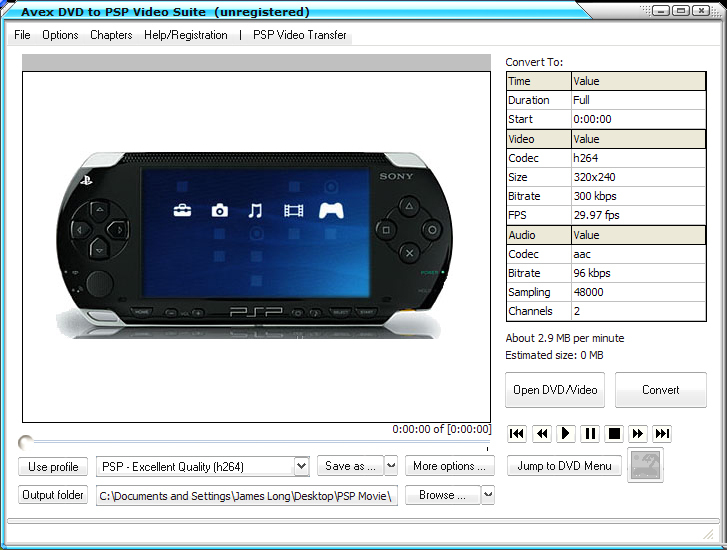 (7) Included PSP video manager. Easy to build your to-be-watched list and click to transfer. Qweas is providing links to Avex DVD to PSP Video Suite 4.0 as a courtesy, and makes no representations regarding Avex DVD to PSP Video Suite or any other applications or any information related thereto. Any questions, complaints or claims regarding this application Avex DVD to PSP Video Suite 4.0 must be directed to the appropriate software vendor. You may click the publisher link of Avex DVD to PSP Video Suite on the top of this page to get more details about the vendor.